What a hoot! The worm's hysterical. Thanks for your visit Diane! Love these guys, I don't think the bird is gonna get away with it! No, worms! Nice weblog.. love your inspirational texts! Thanks, everyone! Loving all your entries too! Some of them were beyond clever. 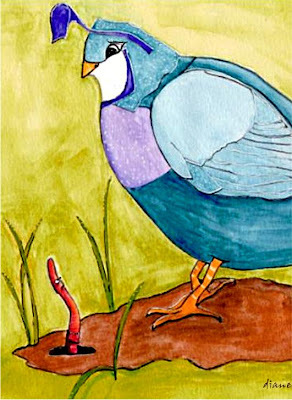 Diane, thanks for your comment and I also love the look on your worms face! Great colors as well! This is beautiful. I love the color of the qual and the worms face is perfect. I love your worms face!! Beautiful bird.Thanks for making me smile.